Good morning everyone! This is Pamela on the blog with a card using the newly released Boutique Borders, Happy die cut and some gorgeous new ink - Piggy Bank, Buttercup, Pacific Blue and Sweet Lilac. 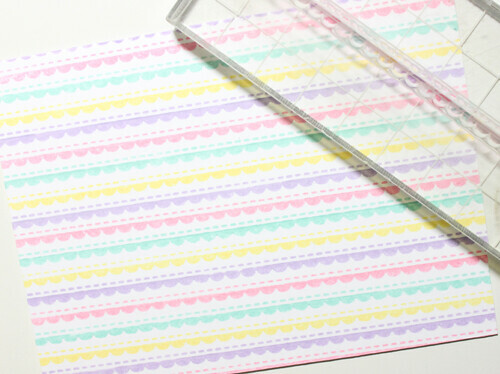 I started off by stamping the thin scallop border in alternating colours on my card stock. This is what it looks like after the stamping is done. 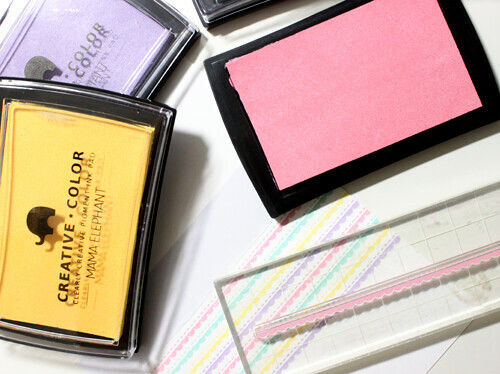 Isn't this soft palette pretty? Since these are pigment ink, there are no splotches when you stamp, and they are very easy to clean off the clear stamps. 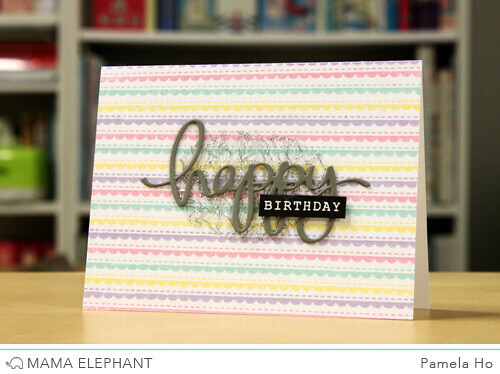 I did some die cutting and heat embossed the "birthday" on a piece of cardstock and adhered it onto some silver foil/wire/whatever-it-is-called. I honestly found this piece in my stash of junk "stuff I won't throw away" pile. It's such a pretty piece and I believe it was used to wrap a present. I love your border background. Great colors and it is SO perfectly straight. I love these colors together. How did you keep those lines so straight? Great job! These colors are absolutely gorgeous! Such a lovely birthday card ♥! GREAT background. The colors are so lovely especially with your silvery stuff behind that awesome sentiment. Love the pastels and the delicate lines! I didn't heat emboss the borders. I just left them to dry and be very careful to not smudge it :) Plus these inks don't smudge much! There's nothing that I did to keep the lines even and straight. It was really just eye-balling ._. If you look at the last line, it's actually not that straight.